I've been spending a lot of nights recently on a Nightjar study in the Forest of Dean (photos to follow), which, due to the crepuscular nature of the Nightjar, often gives opportunities for other interesting wildlife sightings, such as these mating Glow-worms. The light from glow worms is cold, and is a form of bioluminescence. It is far more efficient than most light sources we are familiar with. It is caused when a molecule called luciferin is oxydised to produce oxyluciferin, with the enzyme luciferase acting as a catalyst in the reaction. 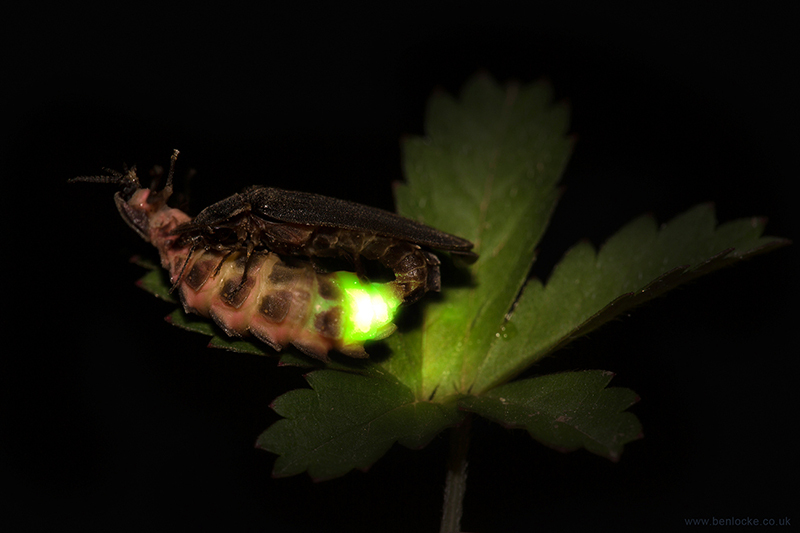 Adult Lampyris noctiluca do not have the same control over the oxygen supply of many fireflies, which can switch their lights on and off in an instant, and take minutes to switch on or off. Larvae, however, have smaller light-emitting organs and can twinkle briefly. Male glow worms have the same ability, but it is rare to see them glow.